Why people Love to go to Ikea? I did not know the answer to my own question. Why people love to go to Ikea? Does Ikea offer cheap items? Does Ikea goods high in quality? Is it because of the food? Or is it just trendy. Nevertheless, people love to go to Ikea. I do, too. That is why the road to Ikea always pack jammed everyday (not everyday actually) with hundreds of people lining up when you were ready to check out and exit from Ikea. The goods in Ikea is not that cheap. It is also not that high in quality. It also does not have so much variety but compare to other places, well, where else can you find a huge furniture plus home decoration store other than Ikea. 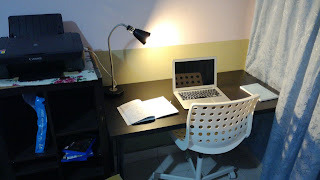 The furniture in Ikea, is cheaper compare to the same product quality in other places. This is not because they are so kind to make it cheap. It's because we need to find the item ourselves, carry it with our big trolley, install it ourselves at home. That is why it is cheap. So suddenly, everything in Social Media went haywire this week with this #MalaysianOfficial1 post everywhere. For all Malaysian, it was not a surprised news after all. We all have been experiencing this thing for more than a year now. Since Sarawak Report published an allegation regarding the mismanagement of 1MDB, this issue never really closed in the heart of Malaysian even though government closed it for good around last year if I am not mistaken. Let the authorities do their investigation and their job. Anyway, I am writing this post not because of I am trying to get involved in this mess or something, as Malaysia government now are very restrictive in what their citizen says (like living in a dictator country or something), let just leave it this way, I am writing because I am amazed on how much money can there be for a person to use. Master Study: Ehlp Open again Today! I heard that eHLP has been open today for those in KKM. Well, what is that mean? eHLP is an online system which will be opened once every year for one month for all working under KKM to continue study. Basically, it is like an application system to get sponsored by KKM/MOH to further study escpecially Master progam and PhD. So, every doctors in Ministry of Health must be busy for this one month period preparing all their document, their 100 words essay, finding two referee and lots of paperwork to be completed. What is important regarding eHLP is not the documentation and the paperwork, but the mindset and decision that need to be made before applying. First thing is to decide what field you want to specialise into and where do you want to further your study. Most doctors did not bother about this, just applying for the sake of applying or peer pressure. I can't say much on which field is the best but it can be divided into two big categories. Clinical or non clinical.